There’s no serious harm in gaining a few pounds, as long as you lose them in the future, right? That is the mind-set of many people who struggle with their weight. Back in 2011, I reported on research suggesting that fluctuating weight loss and weight gain—commonly known as “yo-yo dieting”—had certain health advantages. To explore how weight regain affects health, researchers analyzed the results of a weight-loss program among overweight and obese women. For five months, these women all went on a calorie-restricted diet. At the end of the program, the women had lost 25 pounds on average. Then they met with a registered dietitian, who talked with them about strategies for maintaining weight loss. For the following year, the women were not instructed to follow any particular diet, but they were asked to try to maintain their weight loss. Throughout the whole 17-month process of weight loss and (for most of the women) weight regain, researchers kept tabs on the women’s risk factors for heart disease and type 2 diabetes, including blood pressure and levels of cholesterol, fasting glucose and insulin. Not surprisingly, nearly all risk factors improved significantly for all women during the weight-loss period. And for those who maintained their weight loss for a year after the program, that improvement was sustained. But here’s the surprising (and unfortunate) part. Those who regained weight during the one-year follow-up period didn’t just see some of their risk factors head back toward baseline levels—they watched some of their risk factors become even worse than they had been at baseline. Specifically, regainers ended up with worse levels of total cholesterol and LDL “bad” cholesterol and higher markers of insulin resistance, on average, than they had started out with. These findings are particularly striking, said lead study author Daniel P. Beavers, PhD, because most regainers still weighed less at the one-year follow-up than before they had begun dieting. 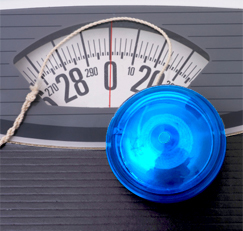 REGAINED WEIGHT: WORSE FOR YOUR BODY? Why did the regainers’ risk factors worsen? Scientists aren’t exactly sure, but the women in this study were all postmenopausal, and prior research by Dr. Beavers and his colleagues has shown that when postmenopausal women lose weight and put it back on, they regain it mostly as fat rather than muscle. And as you grow older, you are more likely to store fat inside your muscle tissue and around critical organs such as your heart—a type of fat that is more harmful to your cardiovascular health than fat stored under the skin. “Though we didn’t study men, the same is likely true with them,” said Dr. Beavers. I asked Dr. Beavers whether the worsened risk factors at the one-year mark might be due to the types of foods that the participants were eating while they regained weight, rather than to the regain itself. He acknowledged this possibility and others, saying, “We have a number of hypotheses we are considering, including whether it was diet or physical activity or some other factor such as stress. We simply don’t have the data to attempt to answer why this happened.” In other words, the study does not prove a cause-and-effect relationship between the weight regain and the worsened risk factors—so more research is needed.